As the 2016 Stanley Cup Finals was set to begin between the Pittsburgh Penguins and San Jose Sharks, most predicted that this would be a close, hard fought series. And on the surface that's held true in the opening games, as Game 1 was settled in the final minutes and Game 2 went into overtime. However, the score was not indicative of the way the games played out. If not for the play of Martin Jones, neither game likely would have remained in doubt as late as they were. 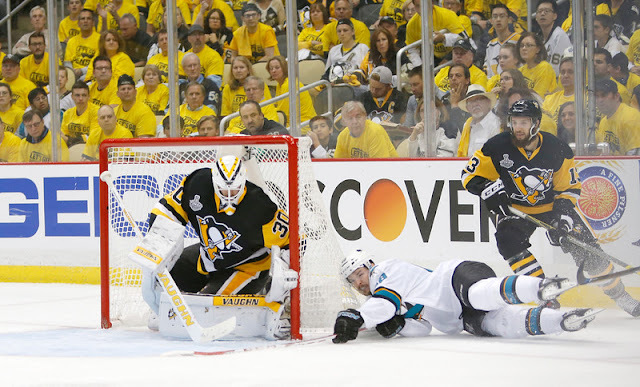 The Penguins' speed overwhelmed the Sharks, particularly on the forecheck, and they were able to leave Pittsburgh with a 2-0 series lead. Now, with the series shifting back to San Jose, the Pens have a huge opportunity in front of them, but they need to be ready to meet it. The Sharks will no doubt come out desperate for the start of Game 3, pumped up by the home crowd seeing a Stanley Cup Final game for the first time in the team's 25 year history. With a loss, they'll fall down 0-3 in the series and face a virtually impossible task of coming back. They can't afford to come out flat, they can't afford to lose the game a face the prospects of needing to win 4 straight. It's imperative that the Penguins continue playing the aggressive game that won them the first two in the series. They need to continue driving play and giving the Sharks little chance to counter with rushes of their own. They need to finish the job. Splitting the two games in San Jose would give them a commanding 3-1 lead heading back to Pittsburgh. Even the worst case scenario, dropping both Game 3 and Game 4, still leaves the Pens with a tie series and two home games out of three. Of course, if they can keep controlling play, the series might not even make it back to Pittsburgh. It would be an improbable sweep to cap off an improbable season, but it's certainly a possibility on the table. But now is the time to plunge the dagger. They've been better than the Sharks through the first two games of this series - they need to continue that. The need to match San Jose's desperation with more of their own. The Penguins have been a resilient bunch this year - they need to harness that resiliency before it's needed and finish the job.